The chemical industry can learn a lot from the common mussel. Not only are the mollusc’s mother of pearl and tough threads with which it clings to the seafloor remarkable, but the way in which these materials are produced could also serve as a blueprint for the environmentally friendly production of complex polymer structures. Scientists at the Max Planck Institute of Colloids and Interfaces have gained the first insights into how mussel attachment fibres, known as byssus threads, are produced in the mollusc foot. They discovered that many steps in this process proceed autonomously, i.e. without any active intervention by the mussel. These findings could reveal new insights into how polymers can technically be assembled to more complex structures. You probably won’t see them at the fish counter, but when mussels are hauled in fresh from the sea, their byssus threads – forming a yellowish mat of fine hairs – are sometimes still hanging from the shells. Despite its unremarkable appearance, the properties of mussel byssus have caused excitement among material scientists. 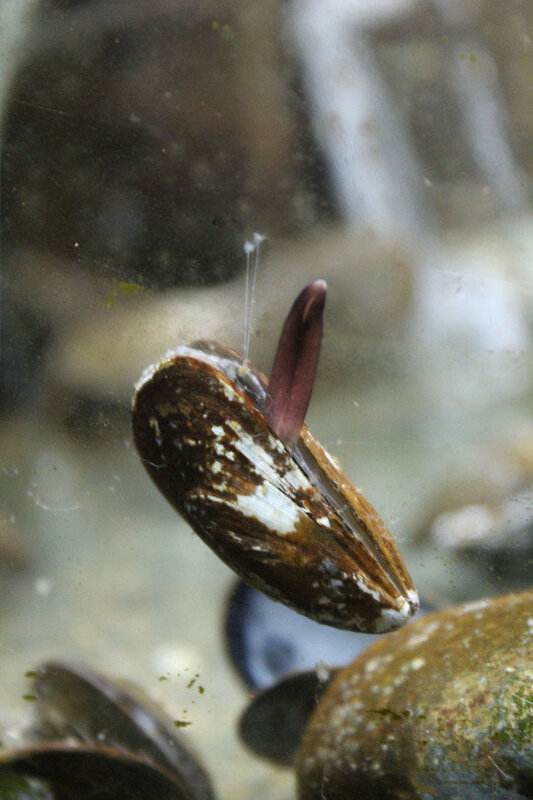 The small adhesive plaque at the end of the thread, which mussels use to cling to stones on the seafloor, is unsurpassed in their ability to adhere underwater. The biopolymer that forms the core of the thread is extremely tough and also heals itself when damaged. The cuticle of the thread is as hard as the epoxide resin used to manufacture printed circuit boards, but is still highly extensible. These qualities have inspired chemists to mimic the materials produced by these molluscs. As it turns out, the process by which the threads are produced could also serve as an inspiration to chemists. “Many of the starting materials of the biopolymers self-assemble into complex structures simply because the mussel releases them in a coordinated fashion at specific locations,” says Matt Harrington, whose research group at the Max Planck Institute of Colloids and Interfaces has gained the first insights into the mollusc’s polymer factory. Scientists have long known that mussels spin byssus threads in a fine groove in their foot. This occurs when glands secrete the starting substances into the groove. However, Matt Harrington and his coworkers have now found that the glands can be differentiated according to the three parts of the byssal thread. This means, there are separate glands for the adhesive plaque at the end of a thread, for the core and for the cuticle. The starting substances are then mixed in appropriate ratios in small sacs called vesicles. Differentiation of the glands, their position and the point in time when they release their content, are crucial to ensure that the three parts of the filament are formed at the correct sites. 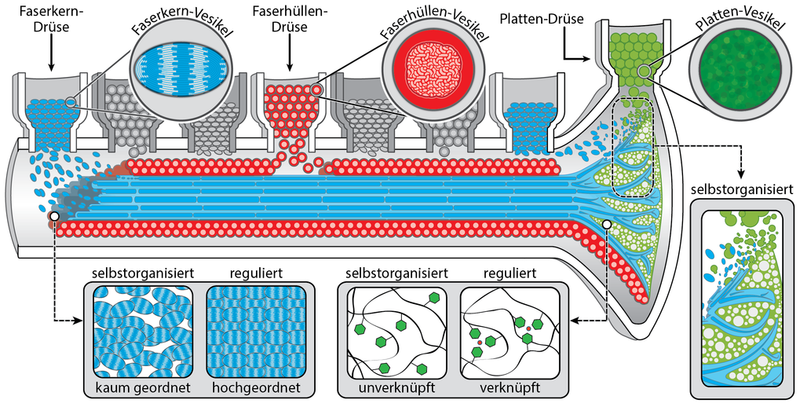 A perfectly choreographed series of vesicles containing the polymer components for the core, the cuticle and the plaque flow into the groove, where they autonomously assemble into a material with very complex structure. The Potsdam team observed this by artificially stimulating the glands in the mussel foot to release vesicles but otherwise paralyzed the foot so that they could study it. They then froze several feet in various phases of thread production and analyzed sections of them using a spectroscopic method that shed light on the chemical composition of the substances. They compared the results of these analyses with the results of experiments in which they selectively stained various chemical components in the threads. “Because only the glands function in the paralyzed foot, we were able to distinguish precisely which steps of the biopolymerization process are self-organized and where the mussel has to intervene to regulate the process,” Tobias Priemel, who performed most of the experiments, explains. The different effects of self-organized and biologically regulated steps were particularly obvious in the case of the thread core. The artificially spun threads emerged from the foot groove looking rather shapeless. Examining the internal structure, the researchers noticed that the core polymers in their experiments were highly aligned only over short segments and not over the full length of the thread, as is the case with naturally produced byssus. “It’s possible that the mussel foot shapes the threads so that the polymers are aligned along their entire length,” Tobias Priemel surmises. When synthesis is artificially initiated and the mussel is unable to intervene, flaws also appear in other parts of the byssus thread. Matt Harrington and his coworkers want to find out how mussels produce threads without the observed flaws and why they do not have to actively intervene in other byssus production steps. “If we knew which factors favour self-assembly of the biological polymers, the chemical industry might be able to produce complex polymer structures in a similar manner, Harrington says. For example, the pH level in and around the vesicles might play a role in self-assembly in the mussel foot. “But it’s just as interesting to learn more about the underlying biological regulation,” Harrington says. It might be explained by simple mechanisms, for example that the foot squeezes the polymers into the desired shape or that the mussel after the formation of the protein structure adds metal ions which crosslink the proteins. Such tricks could also be harnessed for the industrial synthesis of polymers. “My dream is to create – with the help of what we learn from byssus threads – self-healing materials in an environmentally friendly process that have similar physical properties to byssus threads,” Harrington says. Source: Max Planck Institute of Colloids and Interfaces, press release, 2017-03-01.